It’s everyone’s favorite time of year, when the giving spirit runs through our veins and people come together to help and support those in need. This year Bramble Berry sponsored five different families (with a total of 25 people) through the Salvation Army. The Brambleberrians warm my heart. This was an off the clock event that nearly the entire staff showed up for. I couldn’t ask for a better team and support system. This year, we added a new shopper – Jamisen! Team Bramble Berry invaded Fred Meyer (led by the intrepid leaders in orange), each with a shopping list, someone to shop for and a budget for each person. The top of our shopping lists always start with warm clothes and basic necessities for everyday life (diapers, silverware, towels, winter coats, socks, etc). Then we usually congregate the toy section to splurge on the kids for Christmas morning. Does anyone know what Squinkies are? I was shopping for a five year old girl that wanted Squinkies (which I had to use Google to figure out what the heck they were – thank you smart phone). Jamisen isn’t old enough for “big kid” toys yet but I did cave and got him a Gloworm. Yes, they still make Gloworms! This year we got a little silly and decided to all wear fake mustaches. I mean, what’s more fun than confidently walking around in public with a fake mustache? 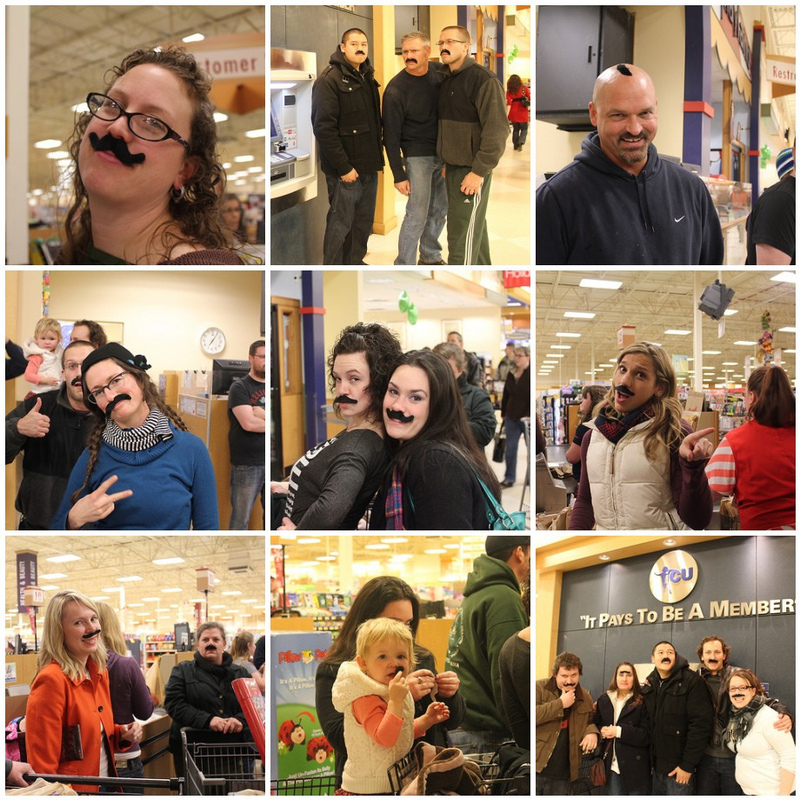 If our presence wasn’t already known in Fred Meyer, the mustaches definitely unveiled our identity. The instigator of the mustache trend was our newest employee, Ken, who has been on the job less than a week. He’s definitely making his mark! And just like every other year, we save the long receipt to see if it’s taller than anyone. It’s tradition! Now take a walk down memory lane and read about our charity shopping trips in 2007, 2008, 2009 and 2010. If you’re interested in sponsoring a family during the holiday season, I would definitely recommend working with Salvation Army. They have always been wonderful to work with. And a shout out to Fred Meyer in Bellingham, WA. 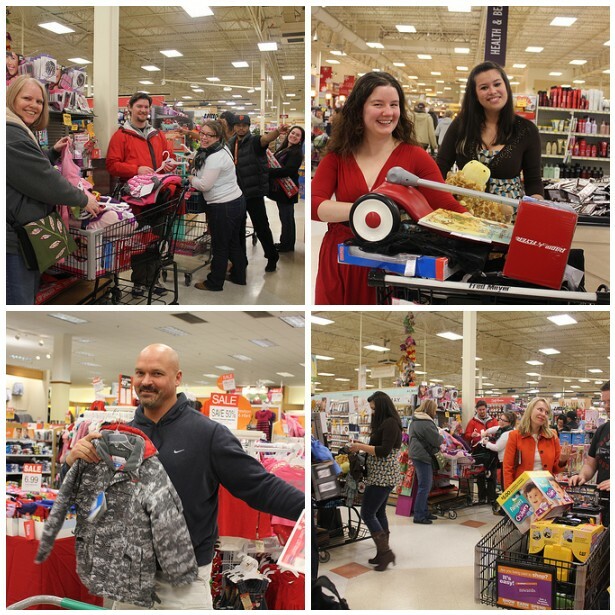 They made a special line for us (and our 20 full shopping carts) with an experienced checker making it an easy shopping experience for Team BB. That’s wonderful news. Even better, is how cute little Jamisen looks in his little orange vest. Thank you for my Jamisen “fix”. I love to see him smile! What a wonderful story from a wonderful company! What a wonderful thing to do! The little one looks so much like your husband in the picture! What a wonderful idea, it is always nice to see what companies do to help out those in need at this time of year. I hope that in recognition of a) your huge purchase and b) the free publicity (e.g. I had never heard of this store before) that Fred Meyer will make a donation to the Salvation Army who are the reason you were there – perhaps a percentage of their profit from the sale. 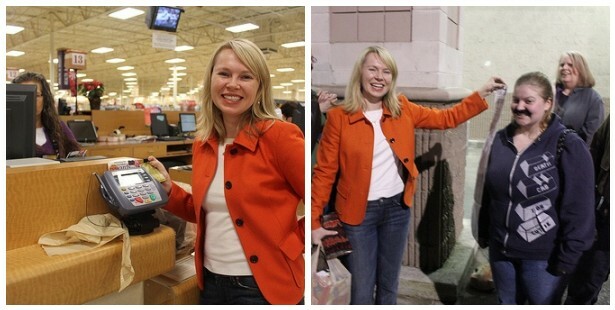 Did that cashier receive a BB gift basket? She deserves one! That’s an amazing order to put through. I’d like to see other companies get inspired and follow your example. It really does make a difference to families who are going through a rough patch. Kudos to you and your staff for making it happen! I already enjoyed reading your charity shopping trips the previous years and I’ve just enjoyed it again! Thank you for giving so much to people and families who need it! It really warms my heart. I’m so glad to hear that you are supporting the Salvation Army. I worked for them one summer and got to see from the inside. They are truly a remarkable organization! I’ve supported them ever since. WOW! Just awesome of you Anne Marie and your bramble berry staff. This post just warms my heart! Great way to start out my Sunday! I think that it is wonderful that BB does this. Jamisen is growing up fast, love seeing the updated pictures of him. As for the glowworm my daughter had one and she loved it, she still brings it with her to bed and she’s 5 now. That glowworm was the best to settling her down when she was having a restless night. I hope Jamisen loves it just as much. You guys should get one of those couponing ladies from what is it, HGTV? to help you out so you can get even more stuff for charity!